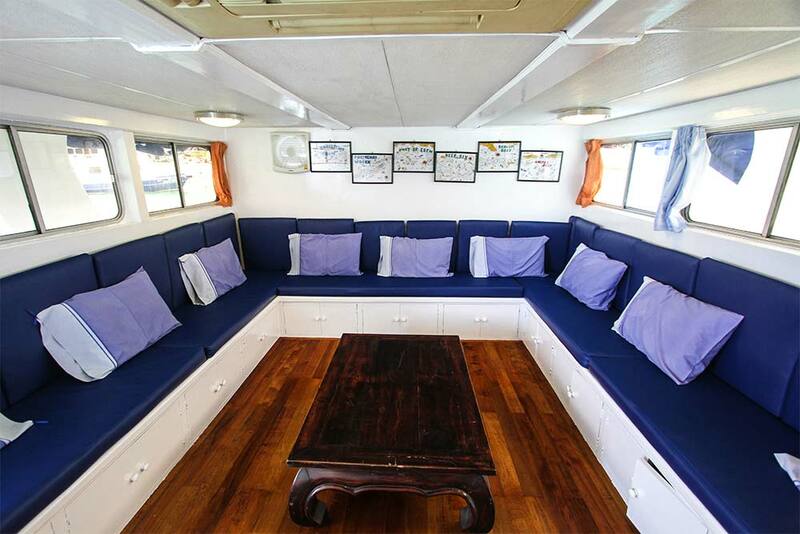 Manta Queen 7 offers the best-value 5-day scuba liveaboard diving trips to Richelieu Rock & The Similan Islands. The value ‘per dive’ is almost unbeatable. 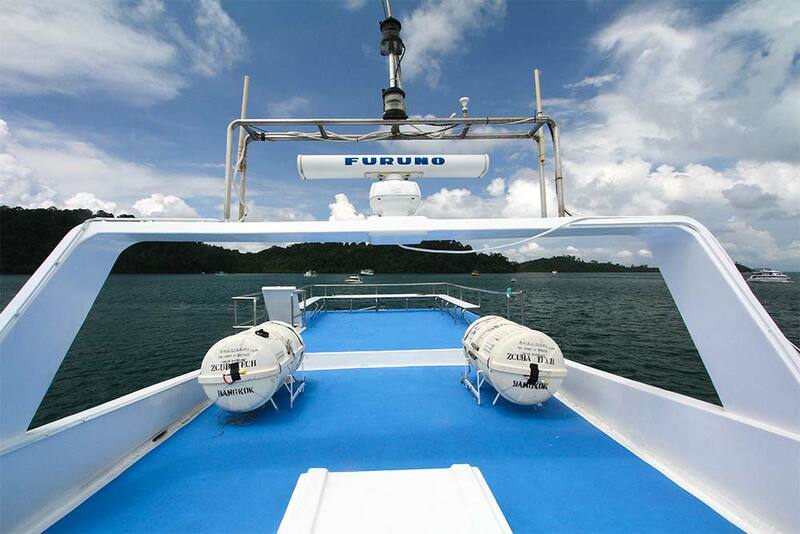 The boat is very popular, and its prices mean it will surely be even more popular among divers who want to see Thailand's best dive sites without spending more than necessary. 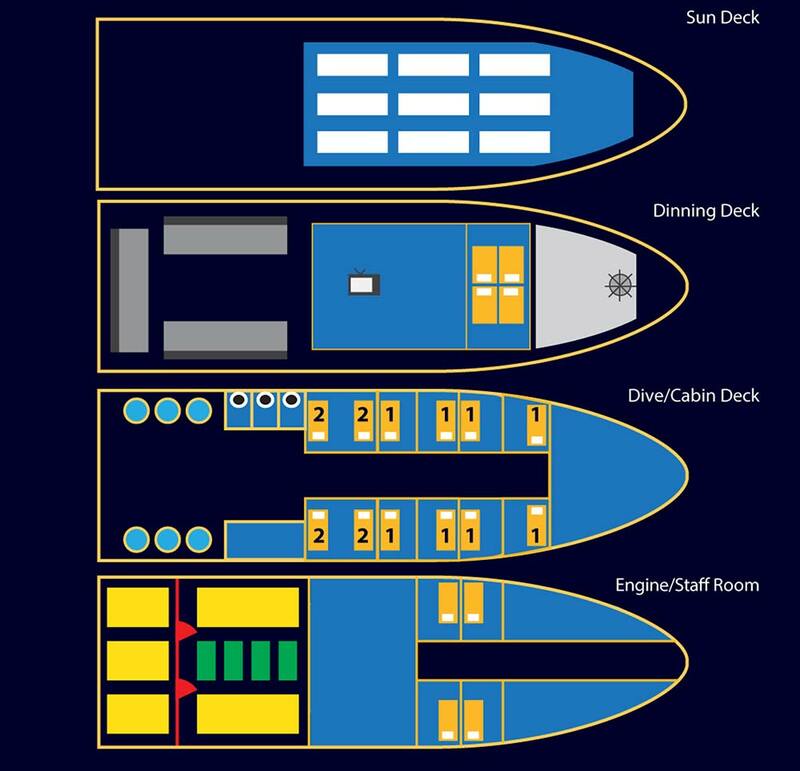 NEW for 2018-2019 MQ7 has a better cabin layout. 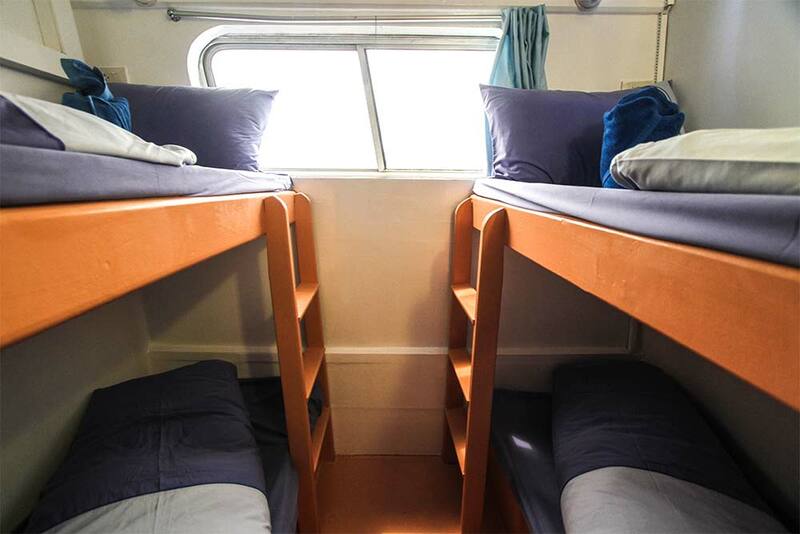 There is still a 4-bunk cabin for the very best value. 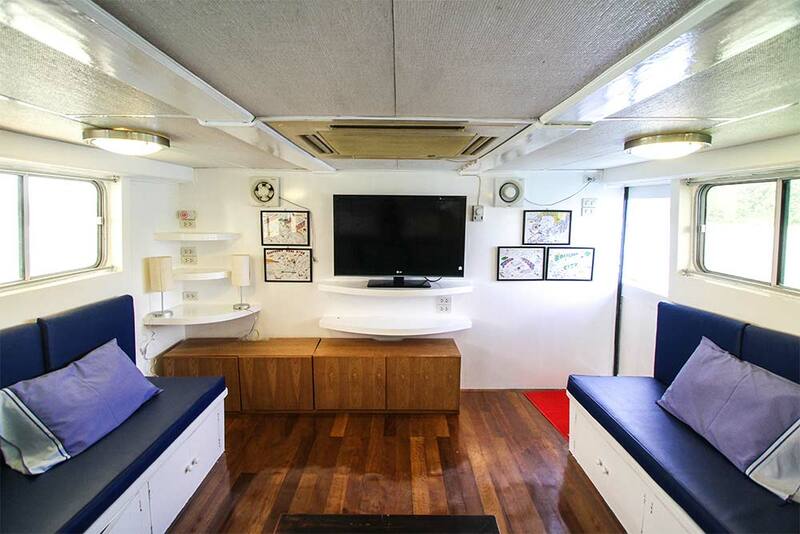 Guests in this cabin use shared bathroom facilities on the dive deck. Now the other nine cabins are twins & doubles and all except one of them has its own private en suite bathroom. Also there is now free Wi-Fi for guests. The signal relies on a cellular mast, so it is not available at all times. 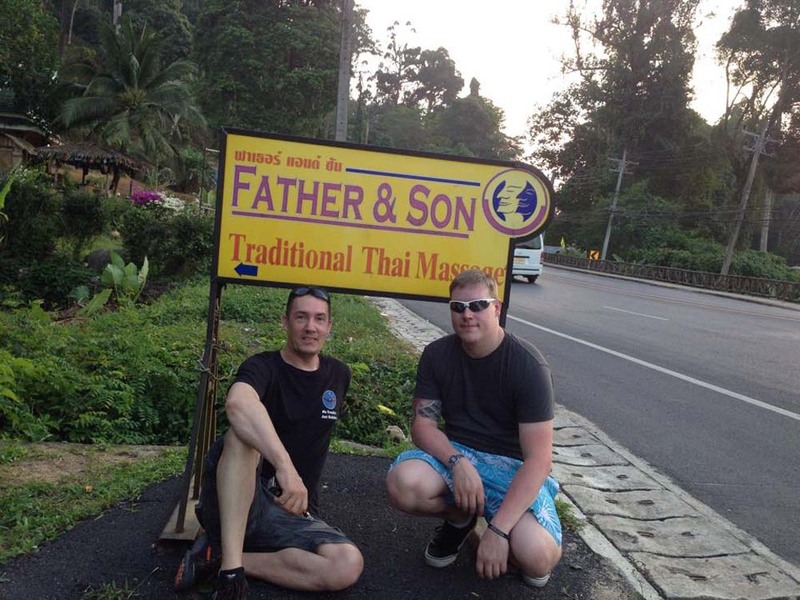 Starting with the free pickup service from Khao Lak, or pre-arranged inexpensive transfers from Phuket, guests are transported to the dive centre for check-in and equipment fitting. The trip sails at night and from early the next morning divers can really immerse themselves in the best diving Thailand has to offer. 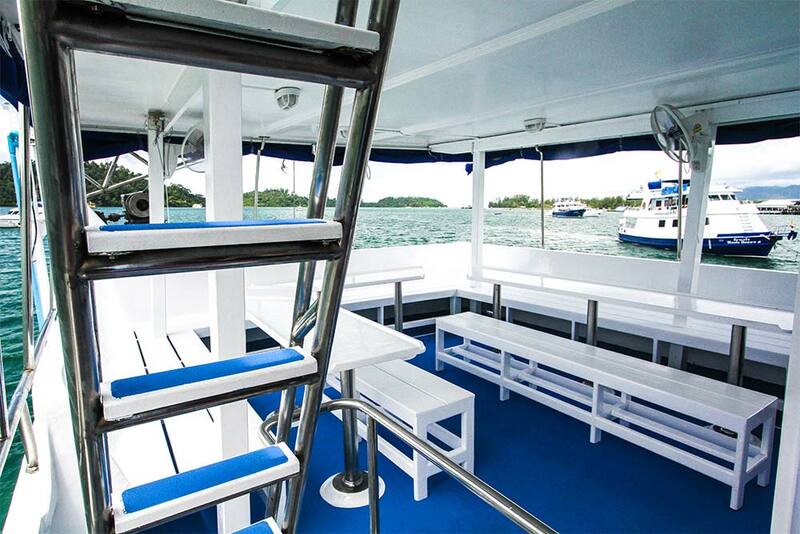 The boat underwent a major renovation during the summer of 2018, ensuring that each cabin, the dive platform and places to hang out and socialize are all in top condition. There’s also plenty of space to chat in pairs or groups, or read a book and/or top up your tan. 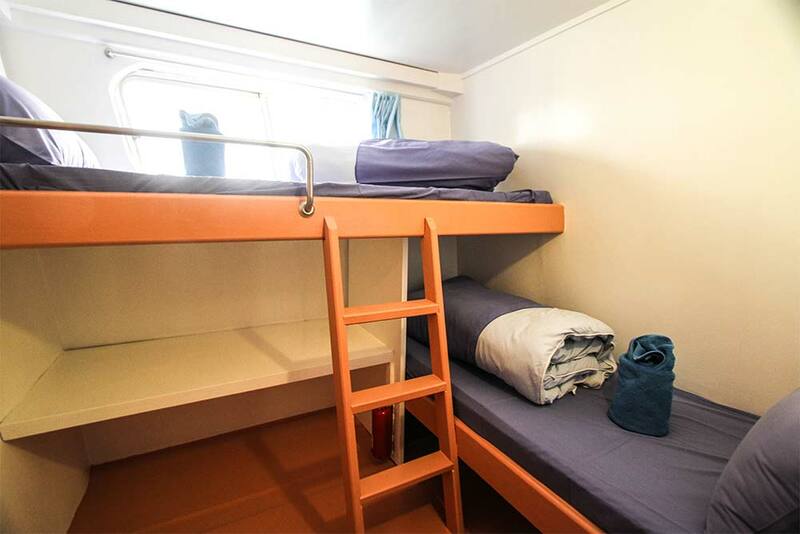 Guests can choose to stay in one of the eight en suite cabins, the standard twin/double cabin or get the very-best value by sleeping in the four-bunk cabin. All are clean and air-conditioned. Delicious meals are served throughout the day and there are snacks and fruits available at all times. The crew and diving staff are on hand to help and serve passengers throughout the trip, and the facilities are excellent, too. This includes a motorized tender dinghy with is used to retrieve some divers and to transport anyone to one of the pristine beaches on these uninhabited tropical islands. Nitrox fills are available, as are several PADI courses, from Open Water up to speciality courses. For the best value and quality diving in Thailand, there is very little to compete with Manta Queen 7’s trips from Khao Lak to The Similan Islands, Koh Bon, Koh Tachai, Richelieu Rock & The Surin Islands National Marine Park. Please note that these trips are 5D/5N, but some websites show them as 6D/5N which is incorrect and misleading. Maybe they do this to make the 'daily rate' look better by divinding the trip price by 6 days, not 5. Manta Queen 7 departs in the evening and returns in the afternoon five days later. Manta Queen 7 has 5D/5N 19-dive trips. Some websites mislead you by claiming the trips are 6D/5N but this is not true. The boat departs in the evening and returns in the afternoon five days later, not six days. After guests are picked up or meet at the dive centre, everyone is taken to the boat in the evening. A light meal is served on board, and the diving begins the next morning. A detailed itinerary for MQ7 is under this text. There is no better way, time or place to take part in a PADI diving course than on a Manta Queen 7 liveaboard diving cruise. 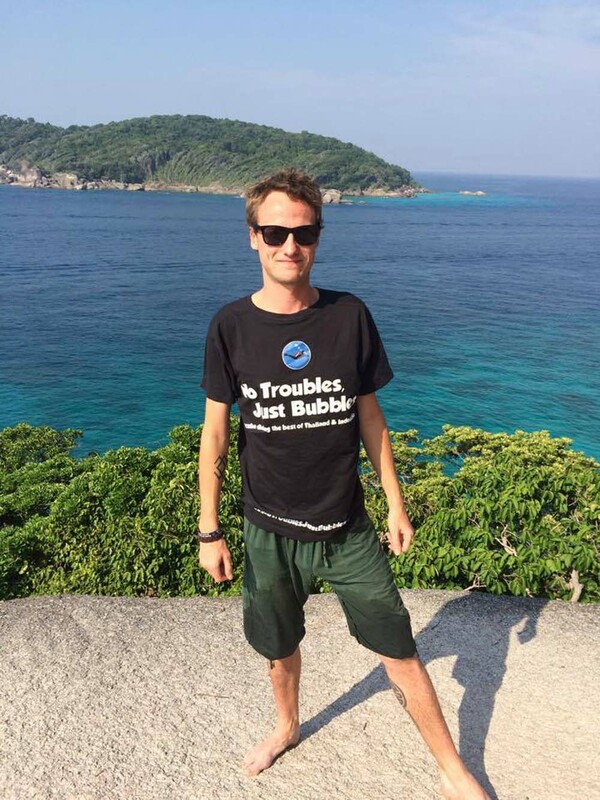 The prices are very competitive, the diving conditions are perfect, and the environment is ideal because there are no distractions such as parties or traffic. Everyone around you is talking about diving, and there to help you get the most out of the course. 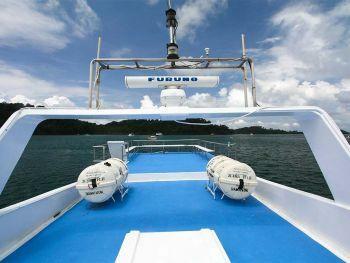 There is a wide range of PADI courses available on Manta Queen 7. Guests who take part in the PADI Open Water Diver course need to arrive in Khao Lak at least 24 hours before the departure of Manta Queen 7, in order to complete the theory and shallow-water skills in the dive centre's brand-new diving pool. Most courses can be booked/confirmed at the last minute, but we strongly advise letting us know as soon as possible, so that we can prepare the materials and instructor in your preferred language. MQ7 guests are picked up in minivans from Phuket Airport and hotels in Phuket & Khao Lak. 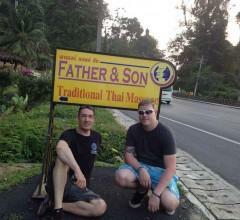 Guests in Khao Lak are picked up for free at 4.00-4.30pm. 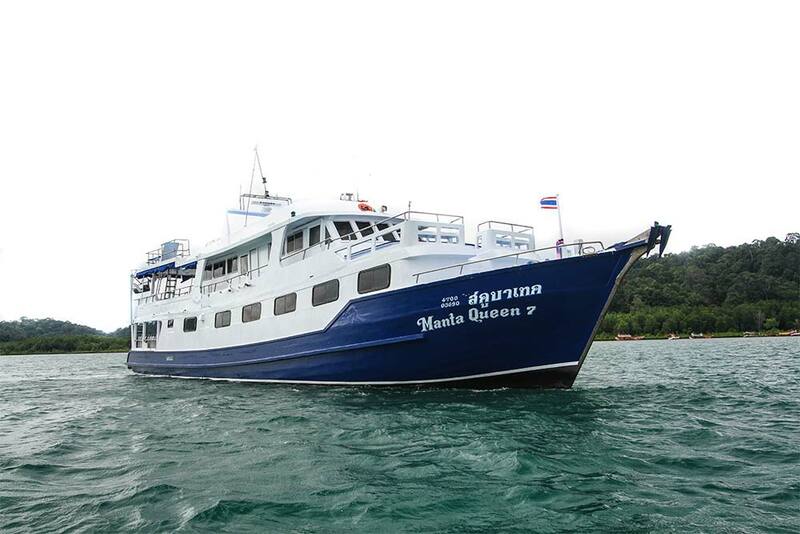 Manta Queen 7's Phuket transfers are available for 300 THB. The pick ups times are 11.30am - 3.30pm. The exact time depends hotel location. Pick ups from Phuket Airport are 3.00 - 3.30pm. Everyone is taken to the PADI centre to fill out a bit of paperwork, make final balance payments, and fit any rental equipment. At the end of the MQ7 trip, everyone is brought back to the dive centre first, before being transferred to destinations in the area. Phuket is 300 THB / diver. Khao Lak is for free. This was an amazing trip! I really loved it! The crew was very kind and the Thai boatboys where so helpful with getting you equipment on, you would blink and suddenly all you equipment was on. The food was good and more than enough, snacks all day long so don’t worry about the food! 2 nd time and always amazing..
"From the first email to arriving back home. Top class service which was above and beyond. Jamie the agent kept me informed every step of the way he even recommended great place to eat and stay. One morning we overslept and Jamie gave us a wake up call. Thanks jamie. The boat trip is not to be missed. I will use this company in the future without doubt the best sevice I have ever experienced." Rates are 'per diver' in shared cabins, and they include Divemaster guide services, tanks, weights, & full-board accommmodation (meals, tea, coffee, drinking water, fruits & snacks). Soft drinks & beer are available on board at good prices. 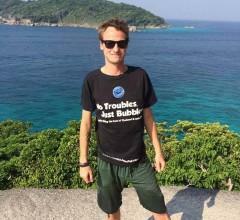 Prices do not include diving equipment rental, if required (@ 2,000 THB / trip) or National Park fees (2,000 THB). Non-diving guests receive discount on trip rates and only need to pay 1,000 THB park fees. 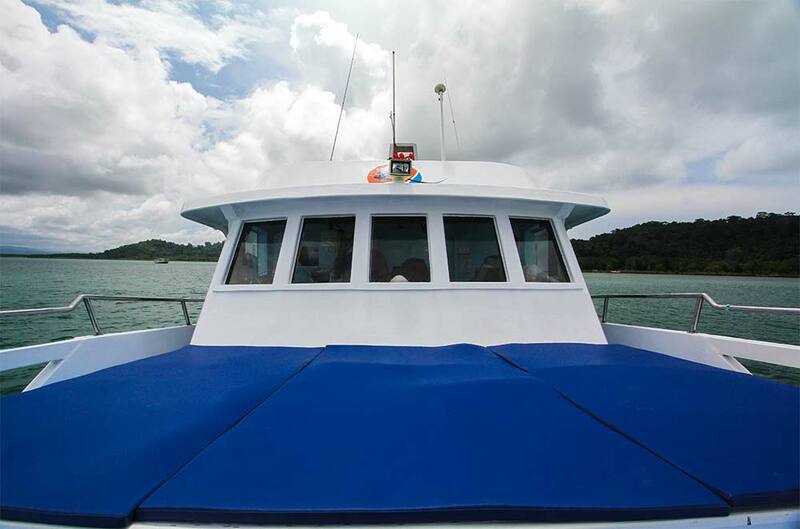 Trip balance, equipment rental, national park fees and any other extras are paid at the Manta Queen office in Khao Lak on the day of departure. Cash is best, but card payments are accepted with a small fee. There is an ATM at the dive centre.